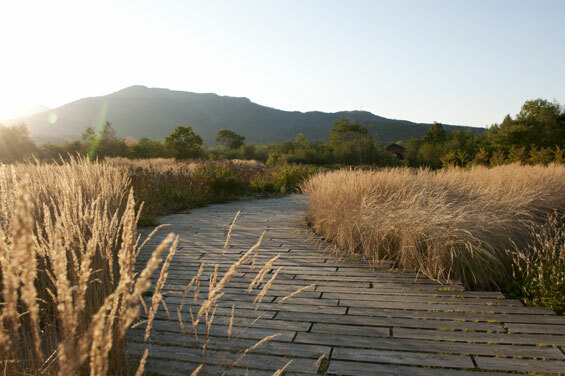 The 240 hectare Tokachi Millennium Forest is the brainchild of the entrepreneur Mitsushige Hayashi, who acquired the land with a view to offsetting the carbon footprint of his national newspaper business, Tokachi Mainichi. The masterplan, which I contributed to with the local Japanese landscape designer Fumiaki Takano, is marketed as having a sustainable vision of a thousand years, and this big thinking aims to not only to make the newspaper business carbon neutral, but also to preserve and prevent the further loss of natural habitats on the island to development. Hayashi believes that, in order for this vision to be viable, education is key. Helping it’s users to take ownership of the park is the best way to ensure it’s future. In a country that sees the greater part of the population urbanised and far removed from landscape and nature, the idea of getting people educated and engaged with the environment is a powerful and novel one. There are brown bears in the forests, hardy wild Hokkaido ponies on the hillsides and the seasons are as dramatic as the mountains and rivers that push through the volcanic terrain. 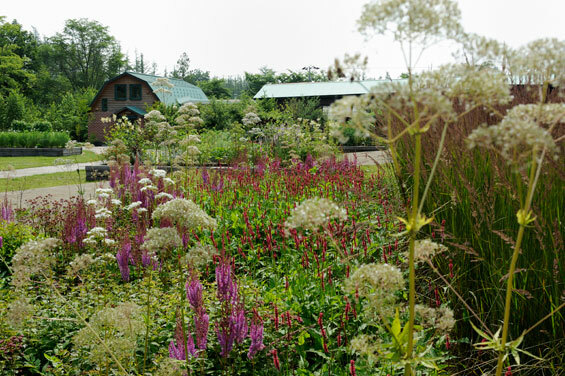 The park aims to draw the public out into this landscape, to open their eyes to nature whilst introducing them to native plants, home grown produce and site specific art. The park sits at the base of the foothills that lead up into mountainous terrain. Woodland sweeps up the slopes and brisk clear water follows the folds of the land. Intensive agriculture nudges the very edges of the park and the majority of the primary woodland has been felled and replaced by larch plantation. Those woods that appear to be natural are, in fact, the re-growth of white birch, oak and magnolia from earlier de-forestation. This is the area that Takano had already started working on when I arrived to help develop the masterplan. The first area to be addressed was a five-hectare expanse of flat ground in front of the restaurant, as people tended to emerge from the woodland walks and then not dare to move any further for fear of the sudden expanse of landscape. It was important to link it more closely with the mountains, so I developed a series of rolling landforms, modelled on the surrounding hills. 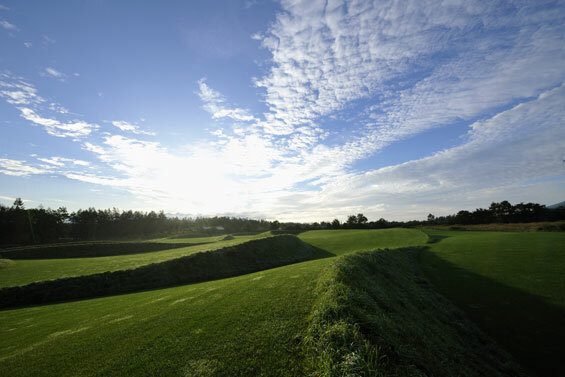 What is now called the Earth Garden is an environment made from a series of dynamic waves in the grassland, which coax people into the space by playing on their curiosity. Without being aware of how far they have ventured, visitors now find themselves exploring the rivers and the woods and participating in an art trail, which includes several pieces by Yoko Ono. For those still unsure about exploring the wilds of the forest there are also Segways available for hire, to make the experience less threatening and more fun, as well as guided tours by local naturalists. perennials that are related to and emulate the waves of plants that live together during the short growing season in the forest. 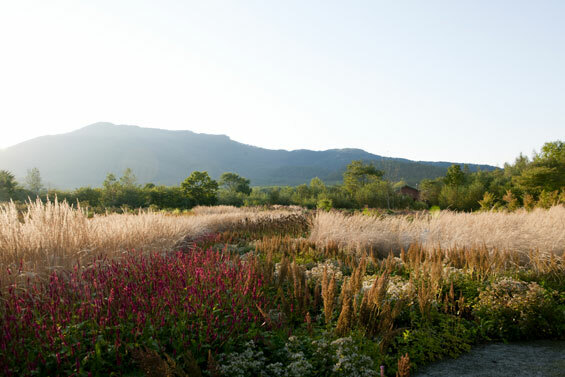 Beyond the Meadow Garden lie the productive Goat Farm, which produces organic cheeses, yogurts and milk, and the Kitchen Garden, which provides vegetables, fruit and herbs for the restaurants on site. In this way the Western ideas of ‘slow food’ and foods of local provenance have been introduced, as well as the, for Japan, unusual practice of communal meals, cooked and eaten in the forest. 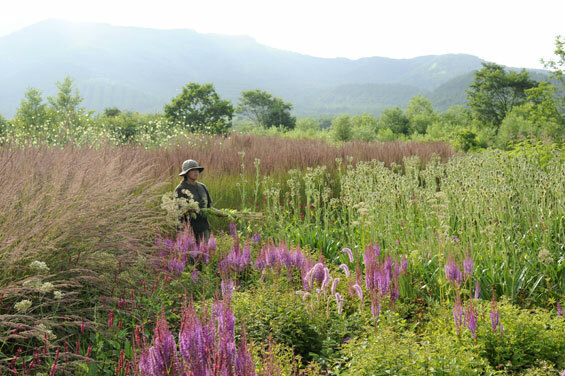 Rather like the dormant seed bank in the forest the burgeoning visitor numbers, even during the recent years of economic uncertainty in Japan, demonstrate that Mr. Hayashi and his team have hit upon a winning formula. Regenerating a real respect for the environment, which I hope will mean that, as intended, the Millennium Forest is still here in a thousand years. 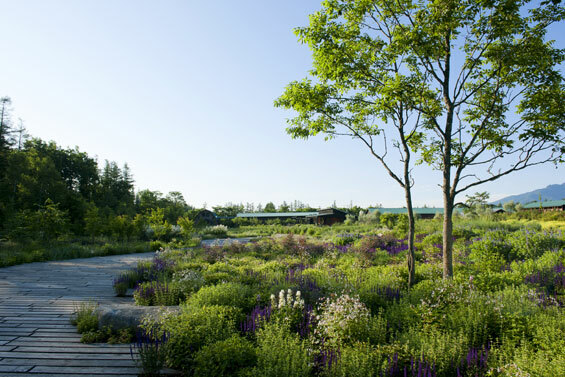 Dan Pearson was recently awarded the Royal Designers in Industry for Landscape Design – one of only three to ever receive the award.